Took a while to find a basic, analog timer. Most were digital. Our boat’s not well suited for more than two aboard – if that, sometimes – which means when we’re sailing a multi-day 24/7 passage we need to alternate who’s on watch. The crew member on watch takes responsibility for watching out for navigational hazards and making adjustments to stay on course and keep the boat safe as weather conditions change. In our case, if not in the cockpit the entire watch, we agree ahead of time how often a check outside is required. For us, that’s as infrequently as every 20 minutes if the likelihood of hazards are low and as often as every 5-10 minutes if the rest of the time. When we’re on easy passages of a few days or less, generally Wayne takes a long watch, and I cover the witching hours, from around midnight until dawn or later. One more difficult passages (like this one [Squeakenstein]), we alternate about every 3-4 hours. Ironically, I’m more a morning person and when working, Wayne generally works swing shift or graveyard. However one of my odd talents is catching catnaps at odd intervals and getting by, while Wayne usually suffers when he’s unable to take larger time blocks of uninterrupted sleep. To stay on track, WendyHinman, Pacific Ocean circumnavigator, author of “Tightwads on the Loose” and public speaker extraordinaire and her husband used inexpensive waterproof Casio watches with alarms for their watches. We seem to have the death touch with them. We killed at least three Casio watches since we started cruising and find the alarms frustrating to set. 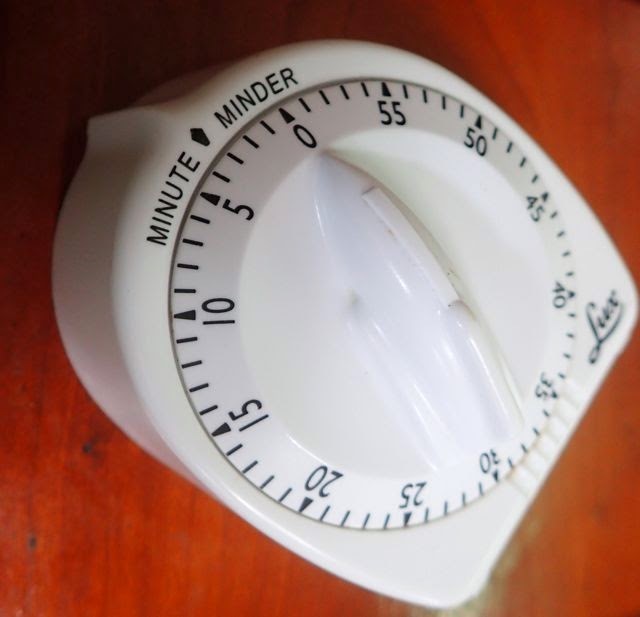 Given the mix of sleep deprivation, the harsh marine environment and crappy watches, we opted for a simpler, even less expensive solution – an analog kitchen timer. It hasn’t failed us yet, though we have slept through it a time or two, it’s a fair trade-off for a system that has to balance when the crew member off watch needs to sleep, not that many feet away from the alarm. Besides, even after spending over 20 years working in high technology, I’m still a Luddite at heart. This post was written whilst on a ~1,000 nm South Pacific bound passage between Contadora, Las Perlas, Panama (N08.37.393 W79.01.870) and Galapagos ECUADOR (S0.57.924 W90.57.750), March 2-11, 2015 and stored until we regained traditional internet. We are currently on passage again, from Galapagos to the South Pacific, about 3,000 nautical miles.